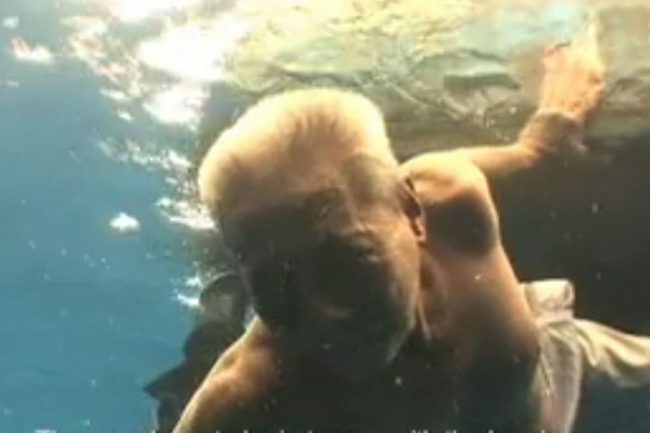 One hand clinging to his boat's gunwale, Harun Muhammad submerges himself, eyes and ears wide open underwater as he "listens" for fish sounds emanating from the blue depths. Harun is one of Malaysia's last "fish listeners," and he and his apprentice son Zuraini are believed to be the only active practitioners of this mysterious and dying local art. "When you listen, it is like through a looking glass -- you can see mackerel, sardine," said Harun, 68, who has fished the Setiu lagoons on Malaysia's rural east coast his whole life. "For us, we only look for gelama (a type of croaker). But in the schools of gelama, there will be other fish. The gelama is the king of fish." Other fish listeners have passed away, retired or turned to modern fish-detection technology as the traditional practice has retreated in the face of dwindling catches and proliferating undersea noise. Studies show Malaysian waters lost 92 percent of fishery resources between 1971 to 2007 due to overfishing. "You can't copy our technique. You must gain the skill and learn the lay of the waters," said Harun. "The wholesalers tell me, 'if you're gone, there will be no more gelama'," which fetches up to 10 times the price of similarly sized fish. But after decades of overfishing, he now "listens" up to several dozen times under the scorching equatorial sun before catching a snippet of gelama song. Modernisation, including sand dredging, aquaculture, factories and fishing trawlers have transformed the Setiu wetlands, a rich but threatened coastal ecosystem centering on a 14-kilometre (9 mile) long lagoon along the South China Sea. Despite the long odds, Zuraini, 44, said someday he will train one of his own sons. "I don't want to see this practice die off," he said. See more on the link.